Marinara sauce is the American-Italian term for tomato sauce, but in Italy it usually refers to a sauce prepared in the style of the seaman’s wife and is a tomato-based sauce with seafood. 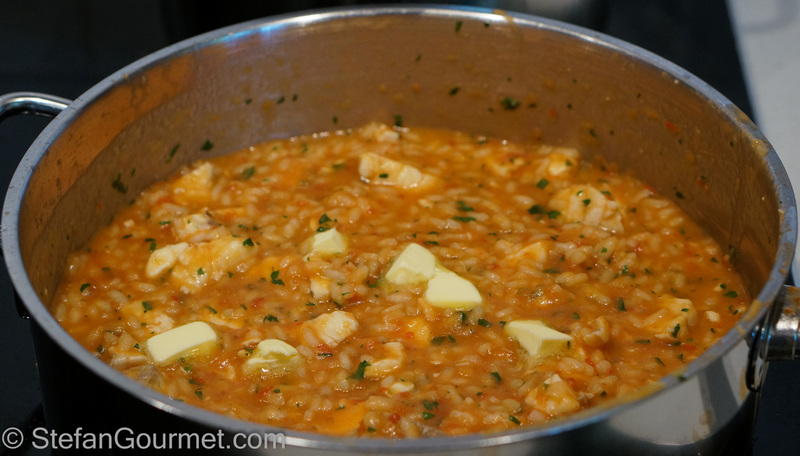 I really liked the risotto alla marinara I had at Ristorante Anna in the Adriatic beach town Gabicce Mare, and decided to recreate something similar at home. 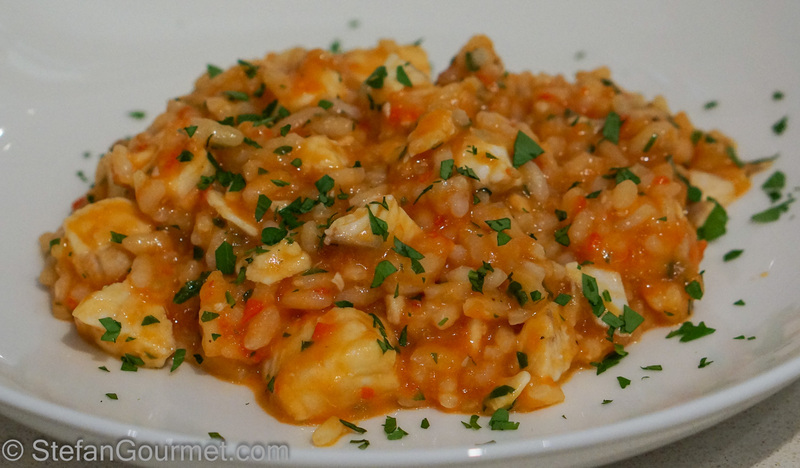 This is the risotto at Ristorante Anna, which was served without parsley and with the fish served on top, cooked until it was very flaky. I kept the fish in moist morsels instead. Otherwise I kept it very simple, just like the risotto at Ristorante Anna. 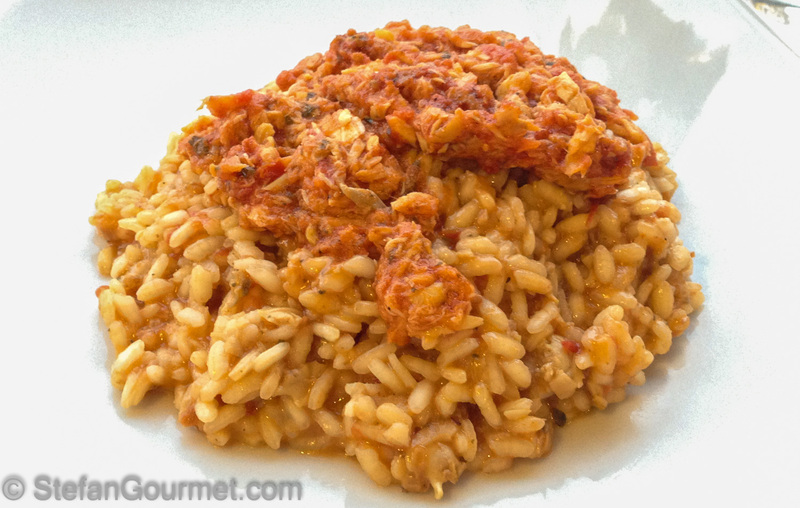 Rice, fish, fish stock, and tomatoes are the main ingredients apart from the risotto standard ingredients onion, white wine, and butter. The fish stock at Anna included shrimp shells for more depth of flavor, and I copied that as well. Here’s what I did. Prepare the fish stock and make sure you end up with about 600 ml (2 1/2 cups). Keep the stock hot. 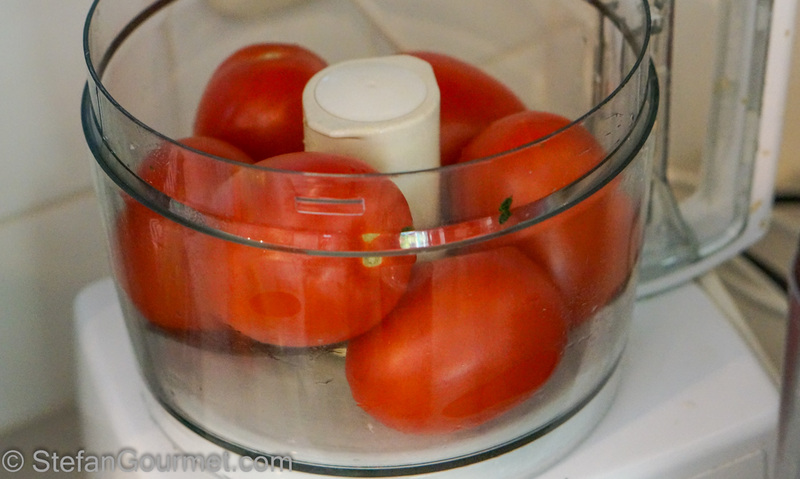 Wash and dry the tomatoes and put them in the food processor. 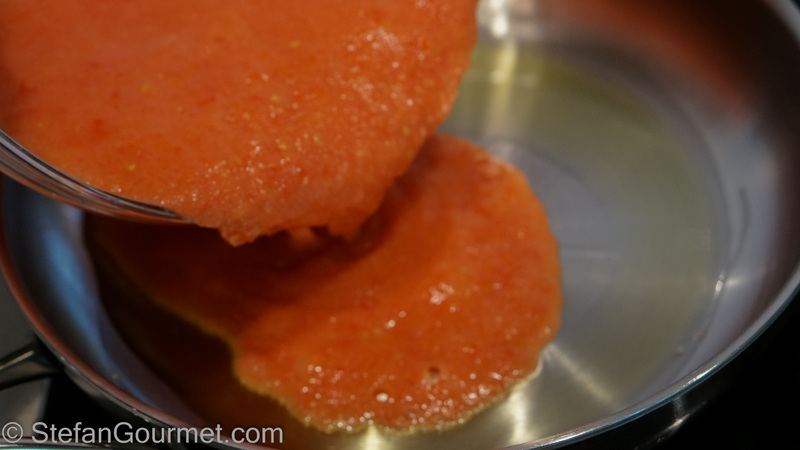 Use a foodmill to sieve out the seeds and large pieces of skin. Heat the olive oil in a frying pan. 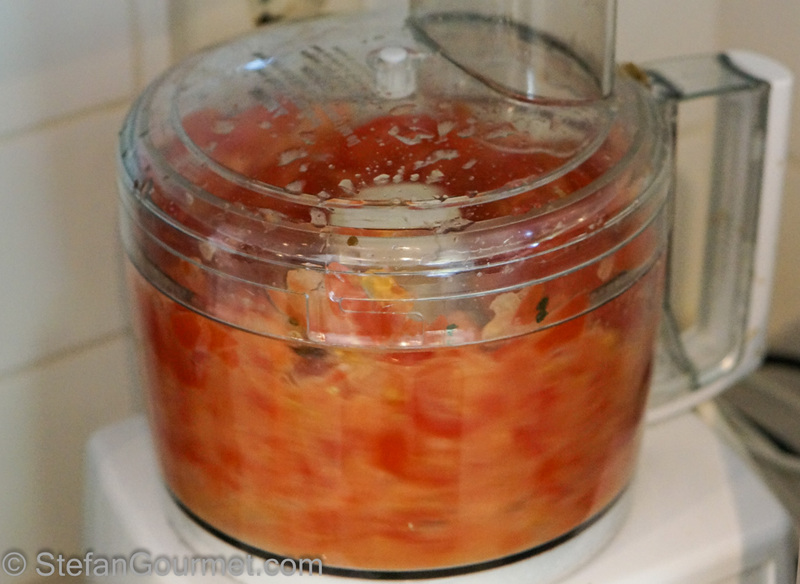 Add the tomato pulp. 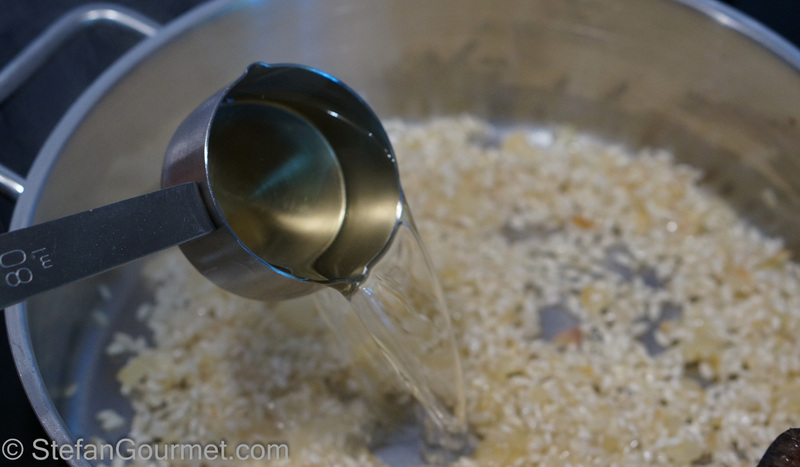 Bring to a boil, lower the heat, and simmer until it is no longer watery. Meanwhile, in a thick-bottomed pan melt 2 Tbsp of the butter over medium heat and add the onion. 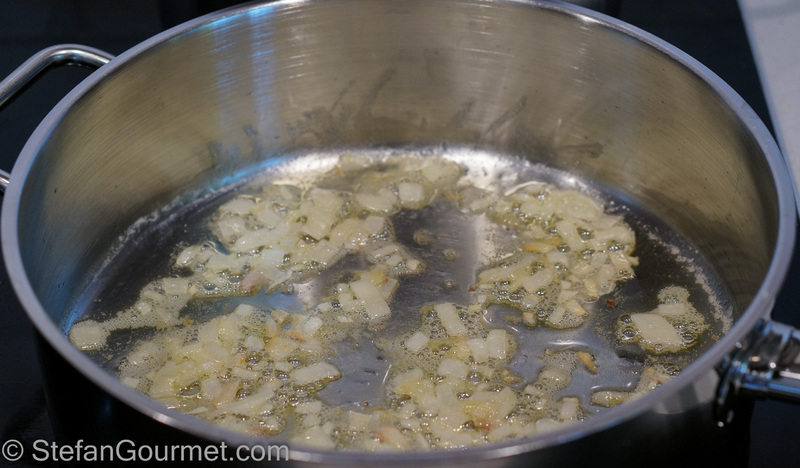 Sauté the onion until soft and fragrant, about 5 minutes. 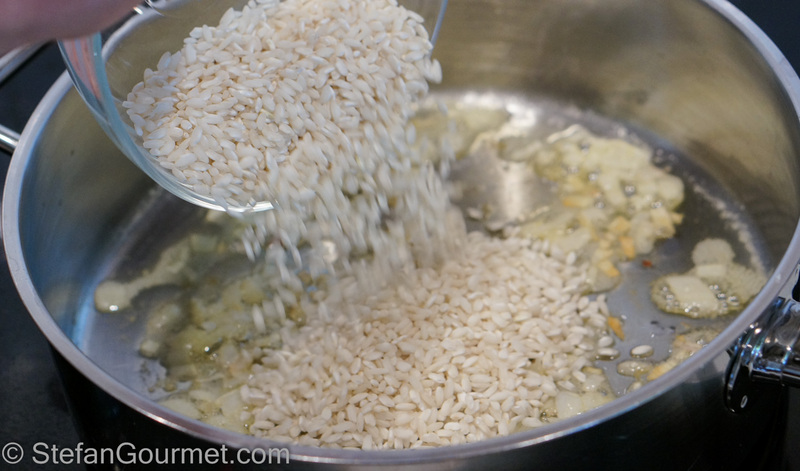 Add the rice and stir until the rice is very hot and covered with butter. 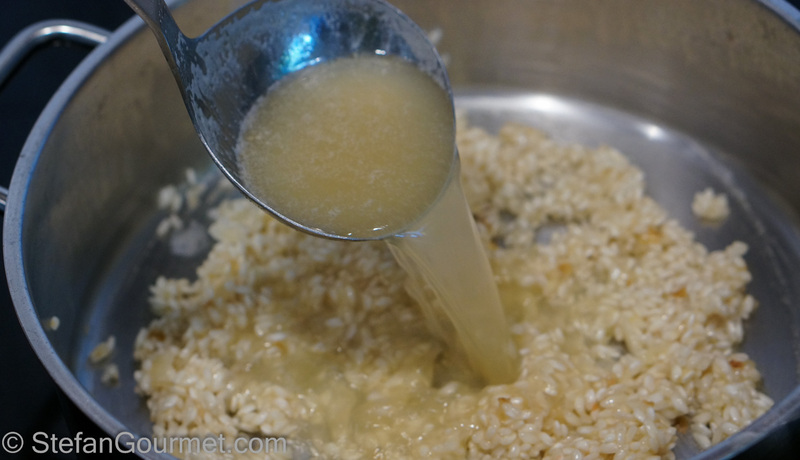 Add the white wine and cook over medium heat until the wine has almost completely been incorporated into the rice. 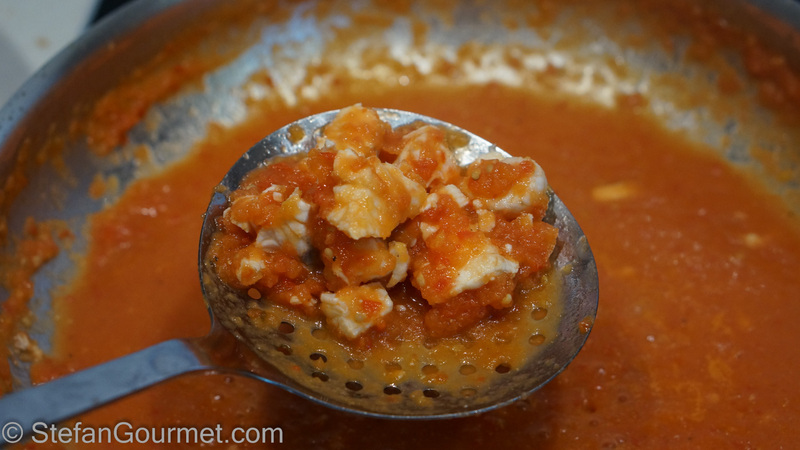 Add a ladle of stock and cook, stirring constantly, over medium heat until it has been absorbed. Keep adding stock ladle by lade and keep stirring until you have run out of stock. The rice should still be somewhat undercooked. Turn off the heat. Cook for a minute or until the fish is just cooked through. 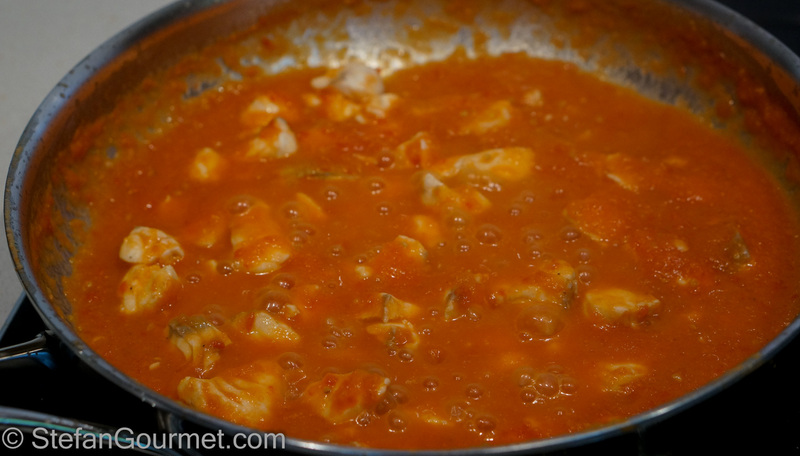 Remove the fish with a slotted spoon. 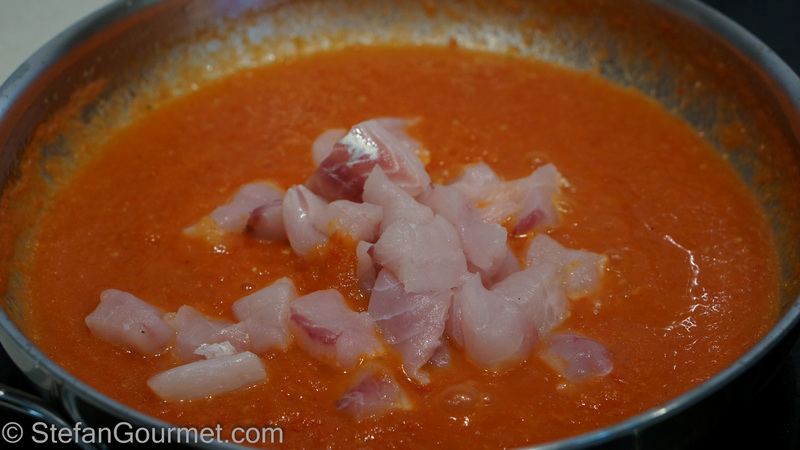 Add the tomato sauce, now enriched with fish juices, to the rice. 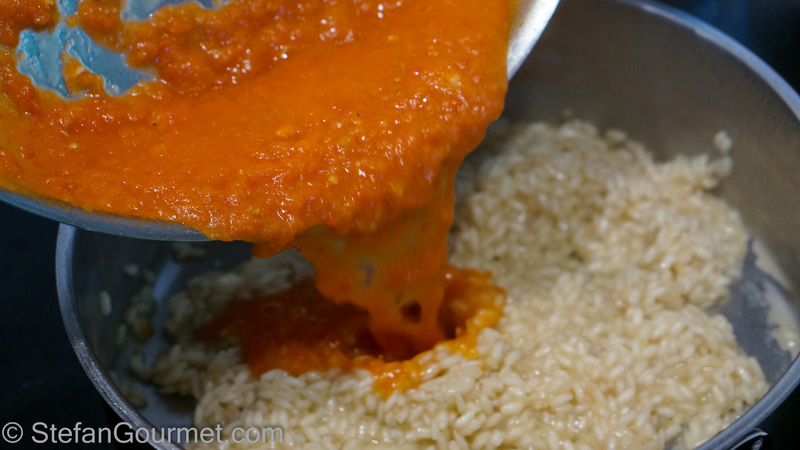 Cook over medium heat, stirring constantly, until the rice has absorbed most of the tomato sauce. Taste for doneness. 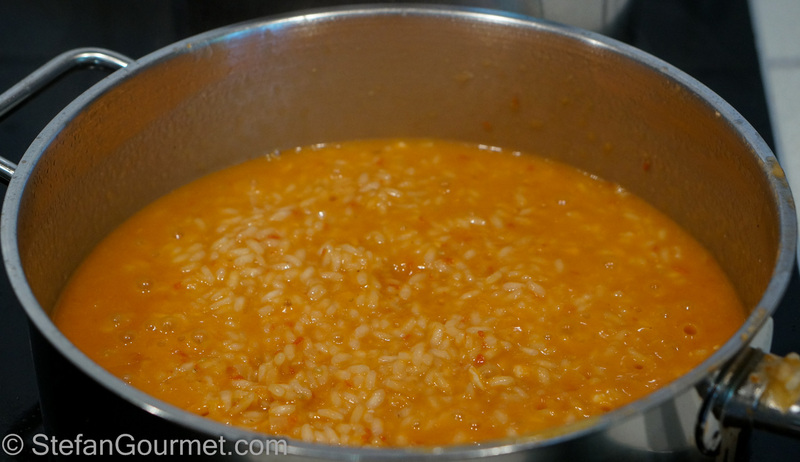 If the rice is not done yet, add a bit of hot water and keep stirring until it is cooked to your liking. Add the remaining butter, the parsley, and the fish and stir gently (trying to avoid breaking up the fish) to incorporate. Allow to rest for a couple of minutes. 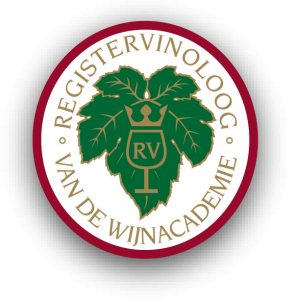 This is great with a full-bodied Italian coastal white, such as a Verdicchio dei Castelli di Jesi or a Greco di Tufo. 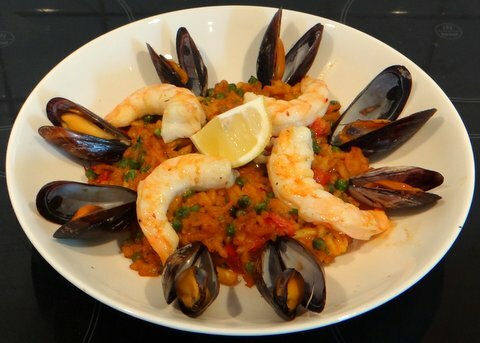 This is my take on seafood paella. Not completely traditional, but nicely presented and very tasty. Excellent. I am just back in from a bike ride and I am very hungry. This is not helping my cause. I am preparing a crab risotto with sea spice this evening. A first for me. Sounds great! Though what is sea spice? A combination of two kinds of seaweed, dried. Lucy brought it back from the west of Ireland for me. A wonderful taste of the sea. Nice post, Stefan. 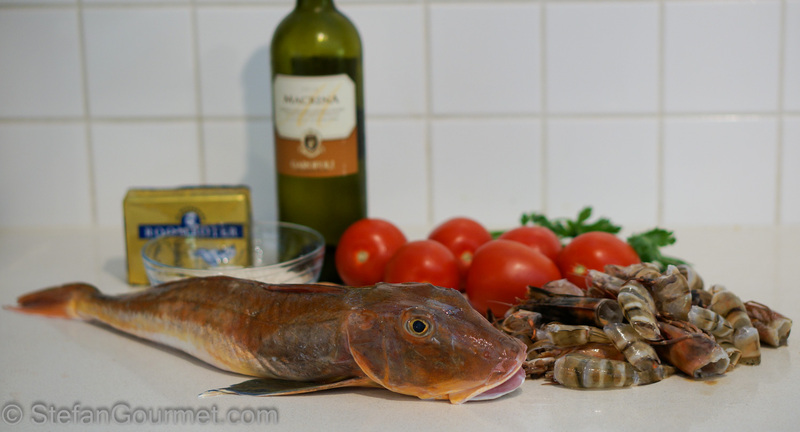 Sounds very tasty but gurnard is one ugly fish. 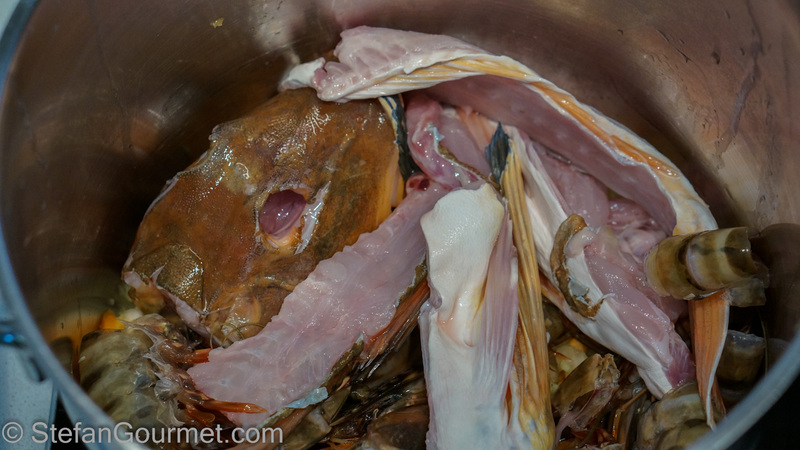 😮 We don’t see gurnard in these parts but from what I have read it’s a really tasty, sustainable, albeit ugly fish. What is the texture like? Hi Emmy, good to see you back. You’ve reminded me to make more risotto than we need on purpose to be able to make risotto cakes the next day. You don’t see the head of the fish in the final dish, and it sure is tasty. Monkfish is even less attractive and more tasty. 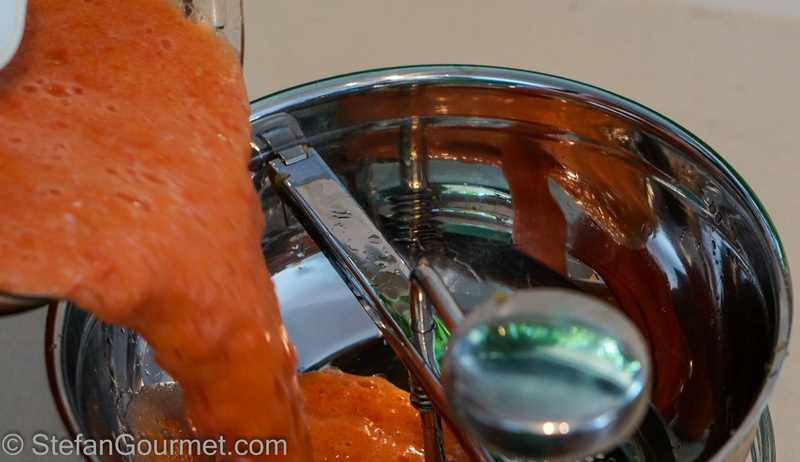 In my daily stroll through wordpress blogs, your food posts always seem to stop me! As always, this looks delightful! Thank you for sharing!